You’re a teacher in the Texas public schools and interested in teaching social studies to students in grades 7-12. That’s great! But to do so, you must pass the Texas Examinations for Educator Standards (TExES ) Social Studies test to show that you have the knowledge and skills an entry level educator must possess. This guide contains information about the test itself and offers a handy study guide and flashcards that will help you prepare. How many questions are on the TExES Social Studies grade 7-12 test? There are 140 multiple-choice questions on the test. You can register to take the test online or over the phone. How much time do I have to take the test? The test time is five hours, and the exam is taken on a computer. The exam tests knowledge in seven different subject areas, which are outlined below. The test format includes single or clustered questions. Single questions present a direct question or incomplete sentence; clustered questions contain passages (called stimulus), with two or more questions that relate to the passages. What are the categories on the TExES Social Studies grade 7-12 test? World History: Tests knowledge of ancient world civilizations, and world history from 600 to 1450, 1450 to 1750, and 1750 to present. U.S. History: Tests knowledge of North America and its exploration and colonization. Includes the Revolutionary era and the Republic’s early years; expansion to the west, the Civil War, and Reconstruction; how the United States emerged as a world power; and political, economic and social developments from 1877 to today. Texas History: Tests knowledge of significant events in Texas though 1821, from 1821 to 1900, and 1900 to present day. Geography, Culture and the Behavioral and Social Sciences: Tests knowledge of basic geographic concepts. Government and Citizenship: Tests knowledge of the United States government, including citizen rights and responsibilities, and how political systems developed. Economics and Science, Technology, and Society: Tests knowledge of basic economic concepts, major economic developments, and economic systems. Includes the free enterprise system and consumer economics concepts. Social Studies Foundations, Skills, Research and Instruction: Tests knowledge of terminology and concepts in social studies. Also tests conflict resolution and problem-solving skills in the context of social studies. Includes how to interpret and communicate, in various forms, social studies information; planning and implementing social studies instruction; and how to assess student progress and needs. The test fee is $131. When should I arrive to take my test? You must arrive at your test center before your assigned reporting time. If you arrive after that time, you will not be allowed to take the test and you will lose your test fees. What should I bring to the exam center on day I take the TExES Social Studies grade 7-12 test? You should bring your admission ticket. Also bring an acceptable form of government-issued identification, such as a passport or driver’s license. TExES encourages applicants to bring at least two forms of identification to the testing center. Please make sure the name on your admission ticket exactly matches the name on your identification. Now, you have some solid information about what the test is like and what to expect. But you need something else — a study guide to prepare you for this important step in your career. Mometrix offers professionally crafted study guides that can help. The guide offers valuable insight into the TExES Social Studies grade 7-12 test, what you can expect while taking it, and advice on how to manage any anxiety about the test. 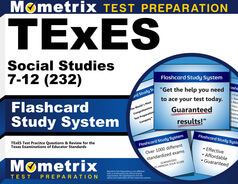 We also offer a flashcard study system that will help you quickly master and solve difficult test questions. You’re almost there. Let us help you the rest of the way with our study tools. Mometrix Academy is a completely free resource provided by Mometrix Test Preparation. 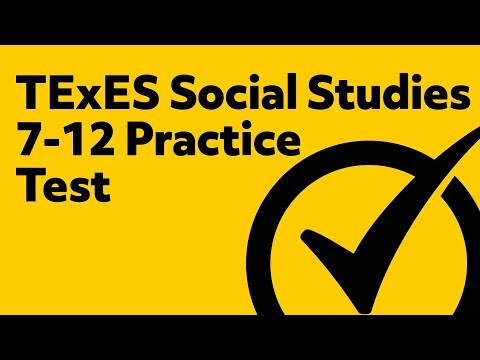 If you find benefit from our efforts here, check out our premium quality TExES Social Studies 7-12 study guide to take your studying to the next level. 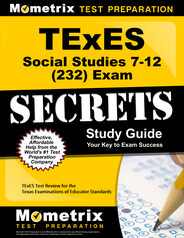 Just click the TExES Social Studies 7-12 study guide link below. Your purchase also helps us make even more great, free content for test-takers.